Last week, I taunted you on Instagram and Facebook with my new favorite breakfast, snack, and pre-workout fuel: a chocolate peanut butter protein truffle. Sorry about that. It wasn’t for long: I gave you the recipe a few hours later, remember? Do I get any credit for that? Ok, no more taunting, I promise. But I do post “bonus” recipes on Instagram from time to time, so if you want to make sure you’re not missing out, you should follow (username: nora_acleanbake)! 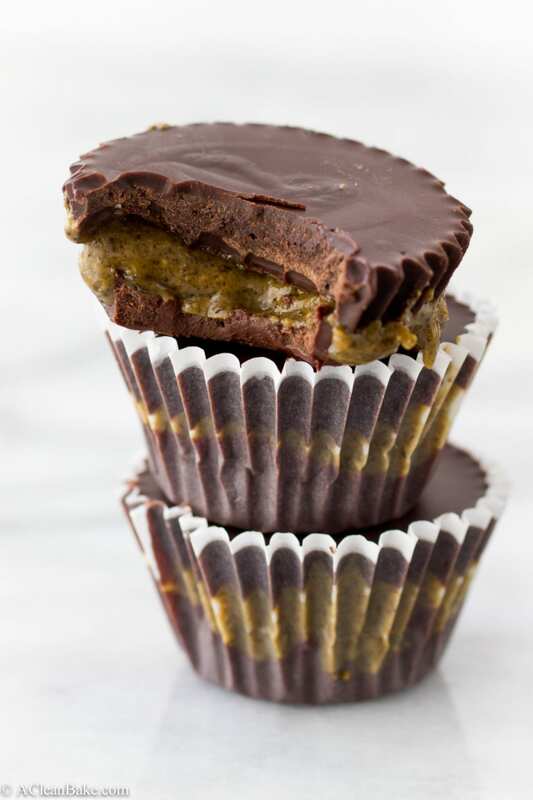 I guess these PB cups are the natural evolution of a peanut butter cup-inspired protein bite. If a PB cup can inspire the flavors of those truffles, then why not the reverse? And, really, who in their right mind is going to turn their nose up at such a gooey-centered, thickly-enrobed-in-chocolate, protein-packed treat? Not me. Would you? I could give you the laundry list of how these peanut butter cups are good for body (healthy fat, extra protein, vegan) and soul (chocolate) but really, those are all the cherry on top of these treats. Not literally. I can’t imagine peanut butter and cherries go very well together. Anyone tried it?? I digress. The point is that a happy home is one which is stocked with peanut butter cups at all times. 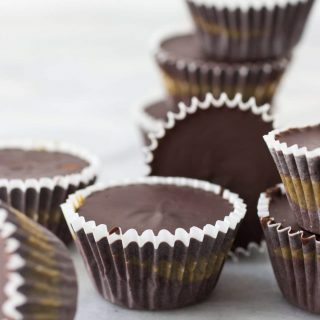 Or, if peanuts aren’t your think (or if you want to keep these paleo-friendly), make that almond butter cups, walnut butter cups, sunbutter cups, etc. It’s up to you! Line a 12-cup mini muffin tin with muffin/cupcake papers and set aside. In a small, microwave-safe bowl, heat the peanut (or other) butter for 20-30 seconds and stir until smooth. Add the protein powder, sweetener and a pinch of salt and stir to combine. If you are having a hard time getting everything incorporated well, it might be because your peanut butter wasn't oily enough. If so, add 1 Tablespoon coconut oil, or more if needed. Set aside. In another microwave-safe bowl, melt the chocolate chips and remaining tablespoon coconut oil in 30-second increments, stirring in between each. After 60-90 seconds, your chocolate should be mostly melted, so continue to stir and the residual heat will melt whatever chunks remain. When smooth and silky, stir in the cocoa powder and a pinch of salt. Divide the chocolate evenly between two bowls. Set aside one and pour the other into the prepared muffin tin, making sure to distribute evenly across all 12 compartments. Shake the pan gently to make sure the chocolate is in an even layer at the bottom of each compartment. Refrigerate for about 10 minutes until chocolate is slightly hardened, then divide the peanut butter mixture evenly across all 12 compartments, spreading it in even layers across the chocolate bases. Pour the remaining chocolate over the tops of the peanut butter layers (reheat slightly if it has become too stiff to pour) and gently shake to smooth out the tops. Refrigerate for 2 hours or until chocolate is hardened. You can replace the peanut butter with any unsweetened natural nut or seed butter than you prefer! Natural nut butters vary in terms of oiliness across brands and even depending on where in the jar you take the butter from (oil rises to the top). 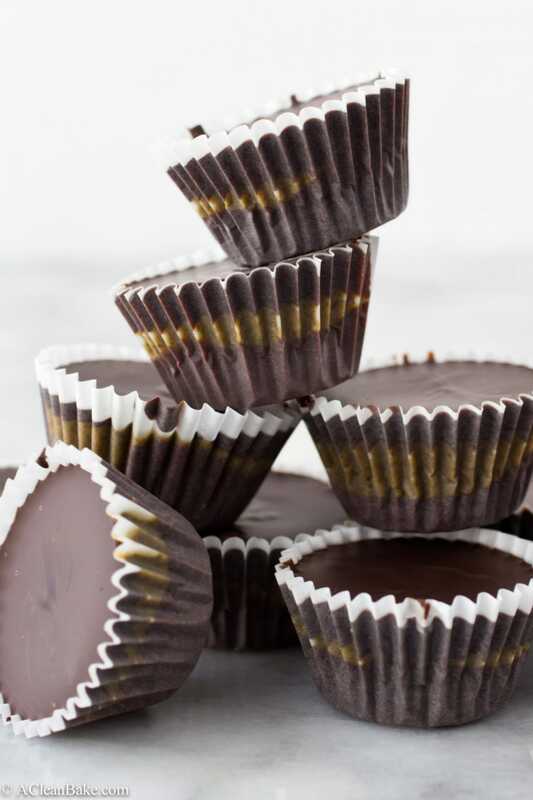 So, if your filling is especially dry, you may need to add more than 1 Tablespoon of melted coconut oil to get it thin enough to spread over the chocolate layer. On the other hand, if it's very runny, you won't need to add any coconut oil to the filling at all. Store leftovers in an airtight container at room temperature for up to 5 days, or in the freezer for up to 3 months. Regarding sweetener: Stevia and monk fruit sweetener products can be up to twice as sweet as coconut sugar and other unprocessed sugar products. So, if you're using stevia or monkfruit, start with 2 Tbsp and adjust to taste. If you're using coconut or raw sugar, you may need 3-4 Tbsp. Yup you 100% know the way to my heart. There really is not much to say except that I will be making these ASAP. That’s totally the only thing TO say! Nuts and Cherries are awesome together – dried cherries that is. I put them in my nut butter protein bars for some extra chewy antioxidant goodness. This will be a great treat! Oh totally! Dried cherries + almond butter are kind of the perfect combo! I’ve never tried cherries with peanut butter though. I guess I should get on that! Nora, I swooned FOR REALZ when you shared these on Instagram and am glad I finally have the recipe 🙂 These look amazing (and now I seriously want a to devour a whole tray of these! Hooray! You should make them and eat them all! Love the “bonus” recipes on Insta (: I second that — my kitchen pantry wouldn’t be complete without a jar of peanut butter. In fact, I always keep a jar around in my dorm for dipping…or just eating by the spoonful when the urge arises 😉 These pb cups look delicious!! P.S. Hope you’re enjoying the beautiful weather today! I do the same thing! Glad to know I am not the only eater of pb directly off of the spoon. I love this idea, Nora…. I mean, what could be better than chocolate and PB? I need to get these stocked in my pantry ASAP! My doc says I need more things like this! hehe!